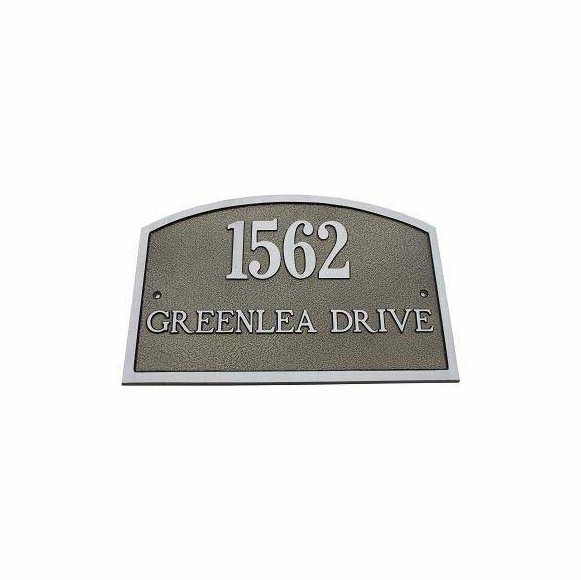 Full Arch Address Plaque - - large 14.25"W x 9.25"H solid cast aluminum address sign holds two lines of personalization. Made in the USA. Solid cast aluminum construction in your choice of 16 plaque colors with aluminum wording and border. Line 2 holds up to fourteen 1" characters (including spaces). Dimensions: 14.25" x 9.25"; weighs 4.5 pounds. Also available in solid brass. Click top link in Related Products.